If your disposal isn't grinding food, it may have stuck impellers. Your disposal uses two swiveling impellers to push food around inside the chamber. These impellers must turn freely for the disposal to work efficiently. To check if the impellers move freely, look down into the disposal using a flashlight. 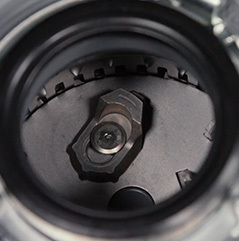 To check if the impellers move freely, look down into the disposal using a flashlight. (Before looking down the disposal, make sure the power to the disposal is turned off.) You should see two metal objects located on the "floor" of the disposal. They should be across from each other, half way between the walls of the disposal and the center of the rotating disk. Use a spoon handle to push on each of these impellers. (See Fig 1) Use a spoon handle to push on each of these impellers. They should move around very easily. If the impellers do not move easily, you should place some hard food items like bones or fruit pits into the disposal. If the impellers do not move easily, you should place some hard food items likes bones or fruit pits into the disposal. Beef round steak bones work best. Pork chop bones work pretty well too. Chicken bones don't work well at all. Three or four fruit pits or round steak bones should suffice. Because of their size and shape, pork chop bones should be used one at a time. Place the hard material into the disposal, turn on the water, then turn on the disposal. Place the hard material into the disposal, turn on the water, then turn on the disposal. Don't be afraid of the noise. Your disposal is a very durable appliance specifically designed to grind these types of items. The material will take a minute or two to grind. Leave the disposal and the water on until the loud grinding sounds go away. Turn the disposal off, then look into the chamber with a flashlight. Sometimes this procedure reveals a foreign object, like a coin or screw, stuck in the disposal. Sometimes this procedure reveals a foreign object, like a coin or screw, stuck in the disposal. If you see something unexpected in the disposal, make sure the disposal is off and remove the object using tongs or pliers. If the impellers are still not moving freely, repeat steps 1 through 6 in the process once or twice more. If three attempts to free the impellers by grinding bones fails, your disposal may require service. If after following our troubleshooting solutions, your disposal still doesn't run, it may need service. If the problem with your disposal is due to defects in materials or workmanship, InSinkErator ma​y pay to have an authorized service center service the disposal in your home at no charge to you.